Crossroads Care Center of Mayville is ideally located on the edge of town where it provides outstanding skilled nursing care, short term rehab and long term care. Our philosophy is to celebrate each day while making a positive impact on the lives of those we serve. Our quiet, home-like campus is a significant asset in the pursuit of that goal. Across the street from a residential neighborhood with nice, single-family homes, we are also a short distance from the Mayville downtown district and almost a stone’s throw from the Horicon National Wildlife Refuge. Our goal is to make your goals happen and that starts with a commitment to listening. By listening, we’re able to identify your goals. We then work with your primary care physician to create a tailored rehabilitation plan that will help you get there. This includes occupational, physical and speech therapy, all designed to help you reach your highest level of mobility and personal independence. We also provide post-acute care, short-term respite care and offer a certified memory program for those suffering with Alzheimer’s or other dementia. We also offer out-patient therapy. We work closely with local doctors. 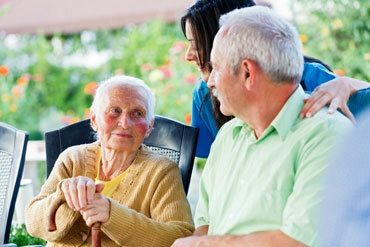 Additionally, we provide on-site behavioral healthcare. Above all, we are always taking care, giving care. We believe that encouragement is the most effective motivation to help our residents succeed. A community centered nursing home, Crossroads Care Center of Mayville is supported by many local volunteers who help residents to feel at home and welcome in this small town about an hour northwest of Milwaukee. Our Activities Director maintains a full calendar with stimulating activities and opportunities for warm social interactions. Indoor activities include bingo, movies and musical events. We also have birthday and holiday celebrations and community outings for dining, shopping, religious services and more. Crossroads Care Center of Mayville is within half a mile of 10 restaurants offering everything from family dining and cafes to Chinese cuisine. We are equally close to the Mayville Library, Mayville Historical Society and eight churches of different denominations. But, you don’t have to go out to find quality dining. Our expert dietician works with the kitchen staff to ensure all meals are nutritious and delicious. We then serve each meal restaurant style making the experience a celebration of good food and good friends. Our facility, surrounded by a walking path, backs up to a wooded area where deer and wild turkeys often make appearances. We have lounge areas – great places to visit with friends and family, or just to read a good book – at the ends of our Deerpath and Meadowview wings, not to mention our wicker lounge, activity room, a spacious front lobby and a patio outside of the dining room with raised garden beds. And we have an on-site beauty salon.